WOW! BEAUTIFUL 3BR, 3 FULL BATH TOWNHOME in Fairway Views with 1ST FLOOR MASTER and COMPLETELY REMODELED, GORGEOUS KITCHEN too! 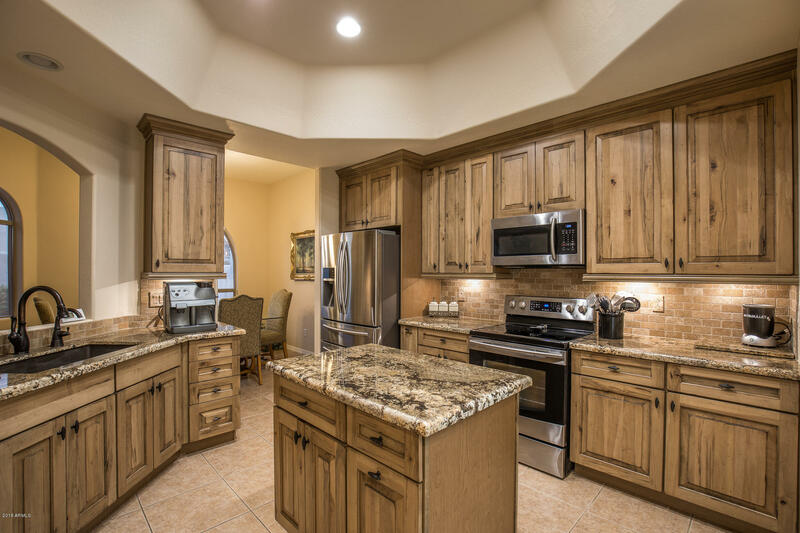 You'll love the SUPERSTITION MOUNTAIN VIEW from private GATED COURTYARD, morning sunrises from the rear patio, LARGE GREAT ROOM, vaulted ceilings, plantation shutters ***RARE GORGEOUS REMODELED KITCHEN with NEW 42'' CABINETS, stainless, HIGH-END SLAB GRANITE & LARGE WALK IN PANTRY TOO! This unique floor plan features 3 bedroom with private bath in each, 2 bedrooms being on the main floor and LUXURY SUITE (2ND MSTR) upstairs with MURPHY BED, jetted tub, sep shower and balcony! ***EVERYTHING has been done in the last 3 years...check out this EXTENSIVE IMPROVEMENT LIST complete with dates and more....CLICK HERE NOW... ALL New Kitchen - about 3 years ago ALL New Roofing - about 6mo ago including balcony floor New Exterior Paint - about 2 yrs ago New French Doors and roll down shutters in upstairs master New Carpet - about 3 years ago New Hot Water Heater with recirculating pump to ALL hot water taps in home - about 2 years ago 3 new comfort height toilets New Water Softener - about 1 year ago New Reverse Osmosis - appr 1 year ago New Sun Screens New Rain Gutters New Garage Door opener and springs New Lighting in all three bathrooms FAIRWAY VIEWS is a fantastic gated community of townhomes with a heated pool and clubhouse complete with fitness equipment! HOA fee includes water, garbage, exterior maintenance, heated pool, recreation center, common area & street maintenance! 8733 E Sandtrap Ct from Jackson Sharp on Vimeo.